In 10-inch skillet, cook beef over medium-high heat 4 to 5 minutes, stirring occasionally, until thoroughly cooked; drain. Remove from heat. Stir in water chestnuts, green onions, 1/2 cup of the cilantro, the barbecue sauce, hoisin sauce and five-spice powder; mix well. Cool 15 minutes. Heat oven to 350°F. On work surface, separate dough into 8 biscuits; press or roll each into 5-inch round. 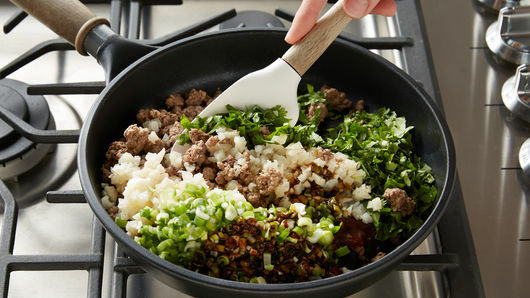 Place about 1/4 cup beef mixture in center of each round to within 1/2-inch of edge. Bring sides of dough up around filling; press to seal and twist slightly at top. Place biscuits in center of ungreased 13x9-inch pan or cookie sheet, twisted side up, in 2 rows of 4 with sides touching. Bake 25 to 30 minutes or until golden brown. Cool 5 minutes. Remove biscuits from pan, keeping biscuits together. Place on serving platter. Sprinkle with remaining 1 tablespoon cilantro. 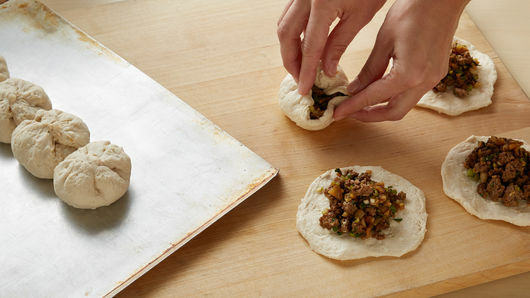 The inspiration for this recipe comes from Mommy’s steamed barbecued pork buns. My mom (I always called her “Mommy”) immersed me in Cantonese cooking by doing what all moms do: feeding her family with the foods she remembered and loved while growing up. One of my favorite memories is of Mommy kneading a pale mound of dough that magically rose beneath damp towels. She would pinch off small rounds, flatten them and then fill them with meat. Then, she’d quickly seal them by turning them in her hand with a few practiced movements. She’d place them on a rack and steam them in the wok, batch by batch. Each batch was proudly revealed by the lifting of the domelike lid, which unleashed a thick swirl of hot steam rising from beneath six glistening white buns, stuffed with luscious barbecued meat. When I was in high school, I sometimes cooked at my father’s grocery store while Mommy and Daddy worked up front. It was a small store, but with a full assortment of canned foods, refrigerated goods and magazines full of convenient recipes that I tried out in the back kitchen. I always loved popping open little canisters of fluffy dough, dropping pieces into boiling stew to make dumplings, or making pigs in a blanket with Vienna sausages and biscuit dough. 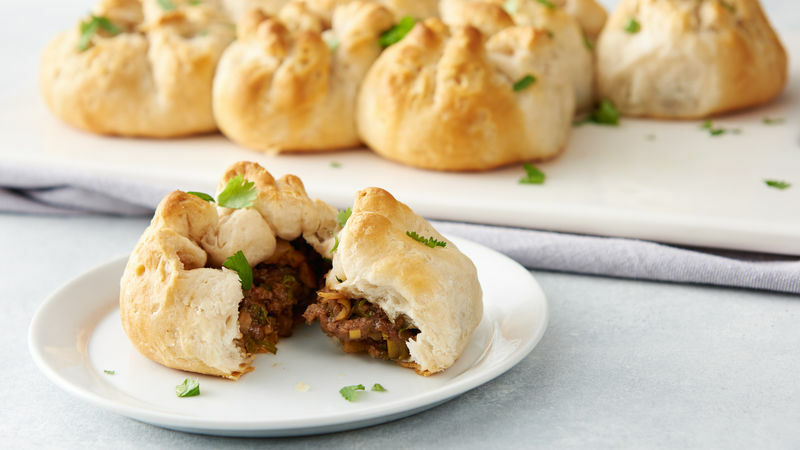 For this recipe, I combined some of the delicious shortcuts I learned in the back of the store with memories of how Mommy’s meat-filled buns always tasted every time I went home. Mommy passed away just a few years ago, but she remains with us, always, through the foods we still enjoy. She forged her own special link in the chain of food that has connected generations of all immigrants to the lands where spices and scents shaped their cultures. This has left an indelible impression on our own nation’s many dishes. I’ll always miss Mommy, but I think she would smile approvingly as I attempt to forge my own links in that chain for my friends and family.